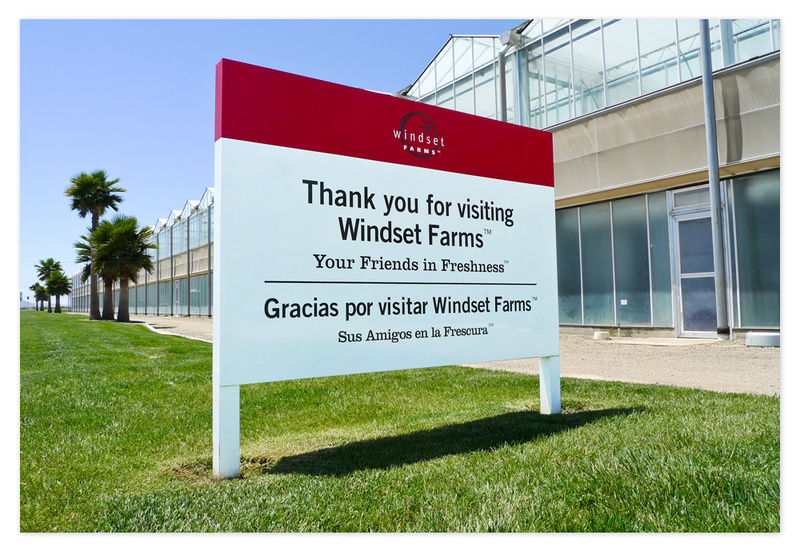 Windset Farms is one of North America’s premier greenhouse growers. 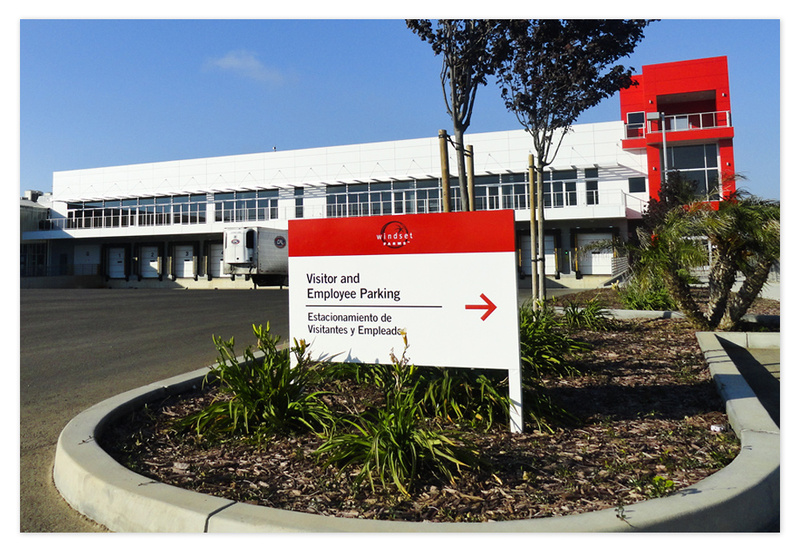 They recently finished phase 2 of a new 3-million square foot greenhouse facility in Santa Maria, California. 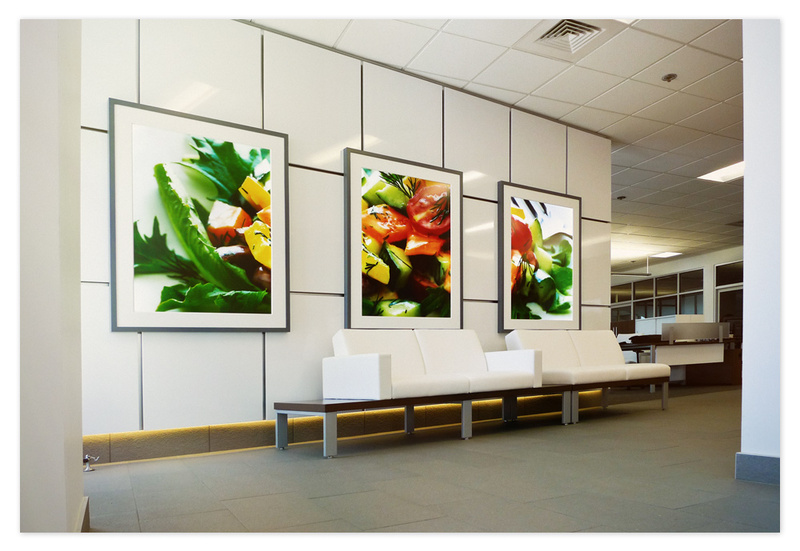 Tugboat Group was originally asked to design feature wall treatments for their new facility to greet buyers from large-scale grocers including Costco, Walmart, and Loblaw/President’s Choice with an impressive environment. 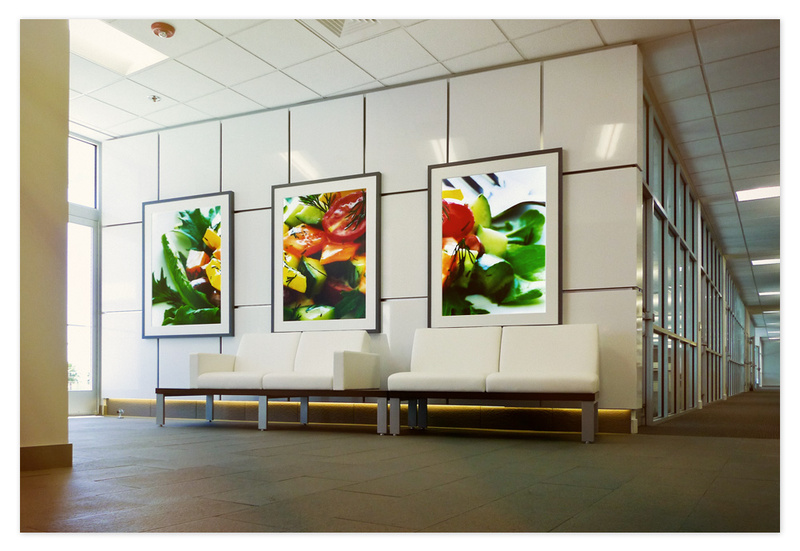 The project scope has since grown into a full environmental and office interior design project. Building on my experience designing presentation/sales centres for real estate developers, I created a high-level concept for the interior design of the foyer and reception area which elevated their office environment to a modern corporate head office. 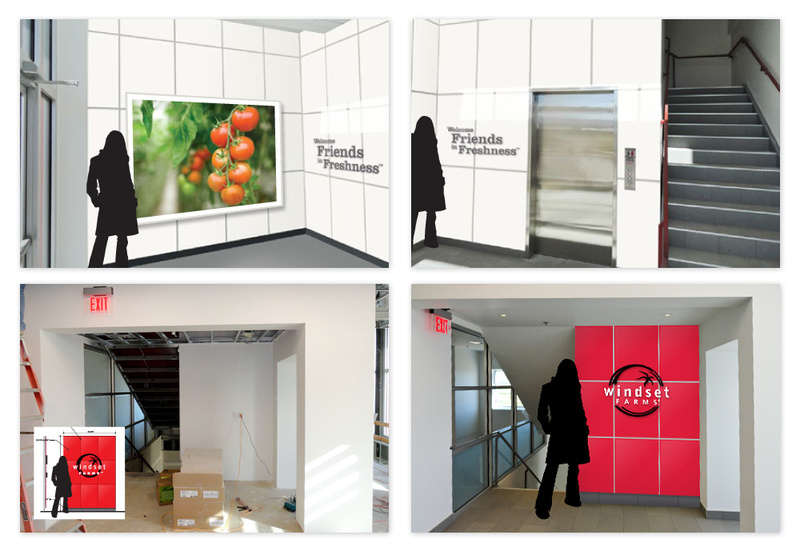 From the original request, I wanted to ensure that the vision for the office design stay on brand with Windset – keeping the design clean and bright with the focus on their core business of growing premium greenhouse produce. This project spanned several phases including interior design of key areas of the main office such as the foyer and reception area, interior wayfinding, and exterior wayfinding. I was able to visit and tour the Santa Maria facility first-hand and it was really rewarding to see the finished project in person. It’s a very impressive greenhouse to visit — Windset has continued to expand their greenhouse square footage immensely since I started seeing the original photos that I worked from; the newest greenhouse runs right up to the side of the red part of the building in the renderings below. 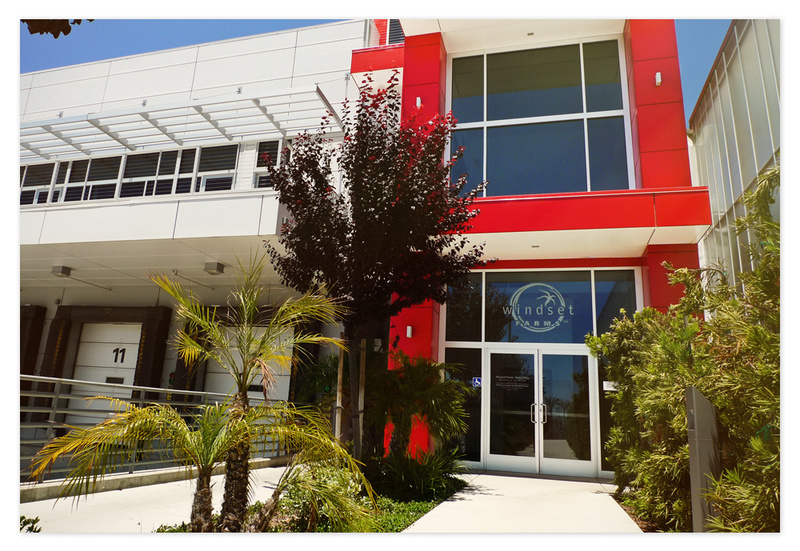 MAIN OFFICE ENTRANCE | The red metal-clad panels used to wrap the main tower were my inspiration for the custom fabricated high-gloss white/red panel walls featured throughout the interior design. I’ve included a couple of photos from further away for scale, including the 12-bay shipping area adjacent to the office entrance, which runs the entire length of the building above the shipping area (bottom photos, above). 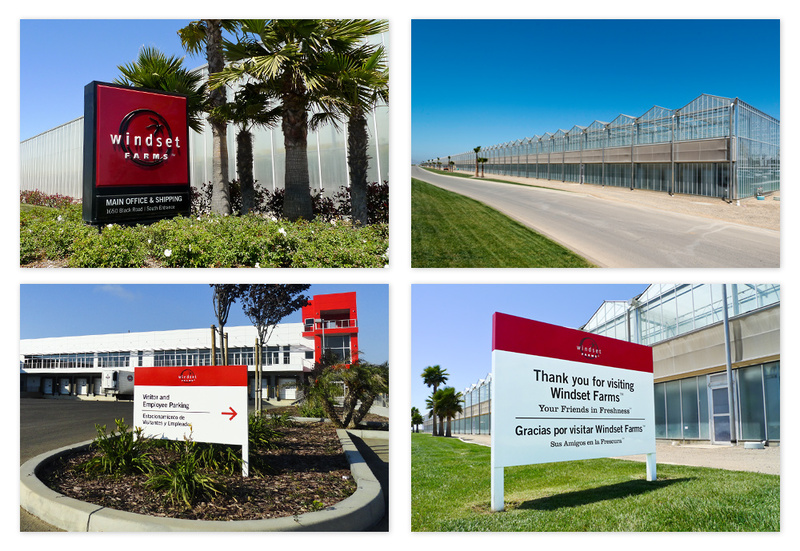 Photos of the main entrance of the Windset Farms greenhouse facility in Santa Maria, California show early construction photos. The top left photo is all that was supplied to get this project started (and all I had to work from for the first few months). FOYER AREA | Ground floor concept renderings of the foyer/elevator waiting area, just inside the building entrance (top photos). 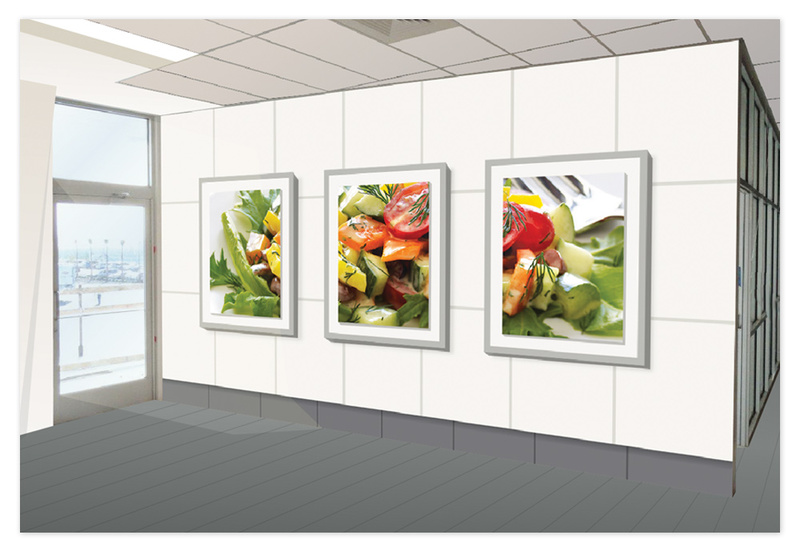 Shown is a panel wall on the left, featuring a large LED backlit lenticular image with custom-built frame, and the adjacent wall with elevator. 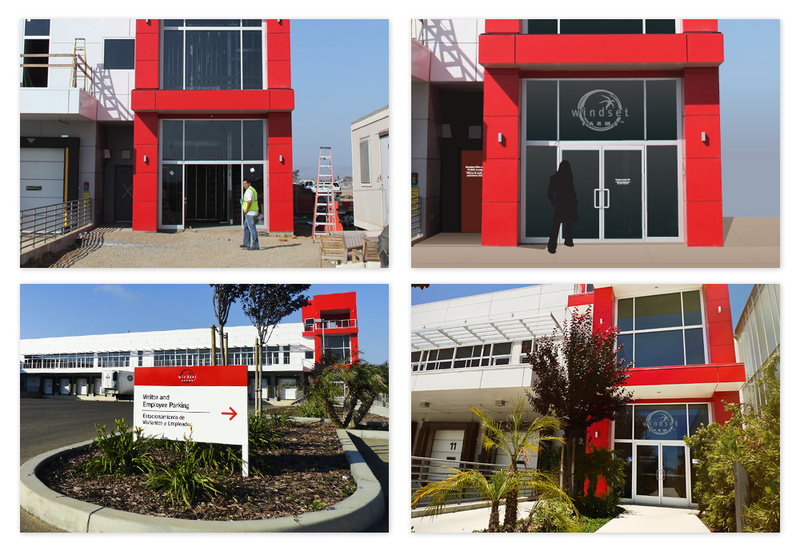 I’ve included a construction photo of the landing area at the top of the stairs (bottom left) and a rendering of the high-gloss red panel wall with CNC cut beveled logo that floats off the wall on pins (bottom right). When you enter the building, the elevator is the first thing you’ll see. 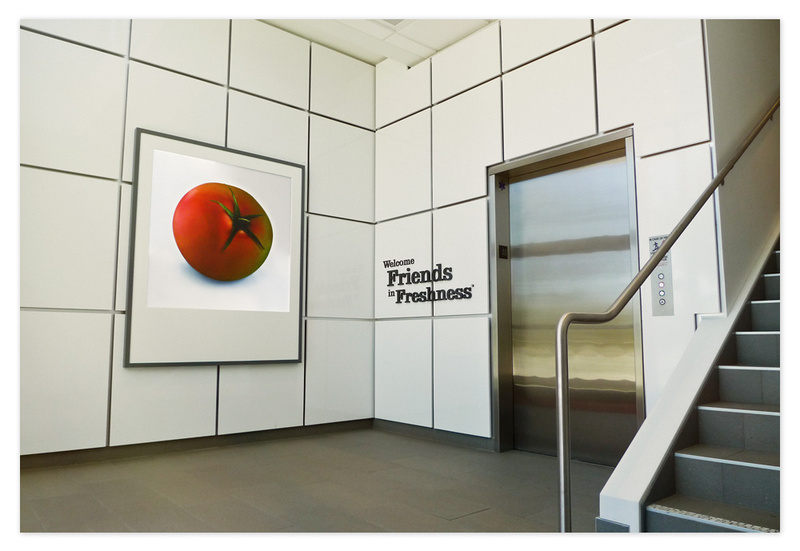 You’ll pass the lenticular image of the tomato ripening as you walk past the 4′ x 6′ LED panel. The welcome message is extruded nylon lettering, suspended off the wall on pins. 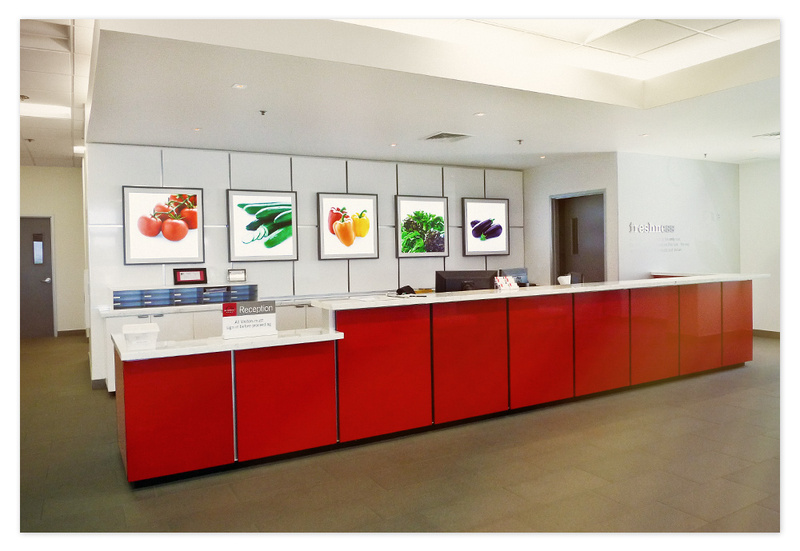 The oversize tomato image in the foyer is a lenticular image that subtly shifts from green to red — the tomato ripens as visitors pass by it. HERO WALL | The ‘hero wall’ is the first thing visitors see as they arrive at the reception area on the second floor, whether by elevator or by taking the stairs. This 18′ wide by 10′ tall feature wall features custom-built high-gloss white panel wall, with over sized floating LED panel triptych with custom-built dark grey frames to match the slate floor, and LED kick lighting along the recessed baseboard. The frames for the LED panels were built so that the backlit artwork could be changeable. Visitors using the elevator approach the hero wall from the left side. 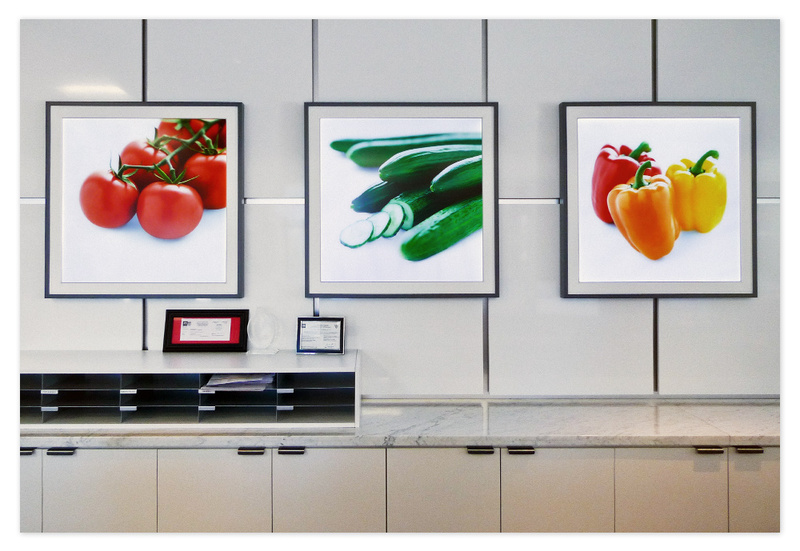 RECEPTION DESK AREA | Visitors are greeted at the reception counter with a matching white panel wall treatment behind the desk, with five custom-built frame LED panels showcasing Windset’s produce. 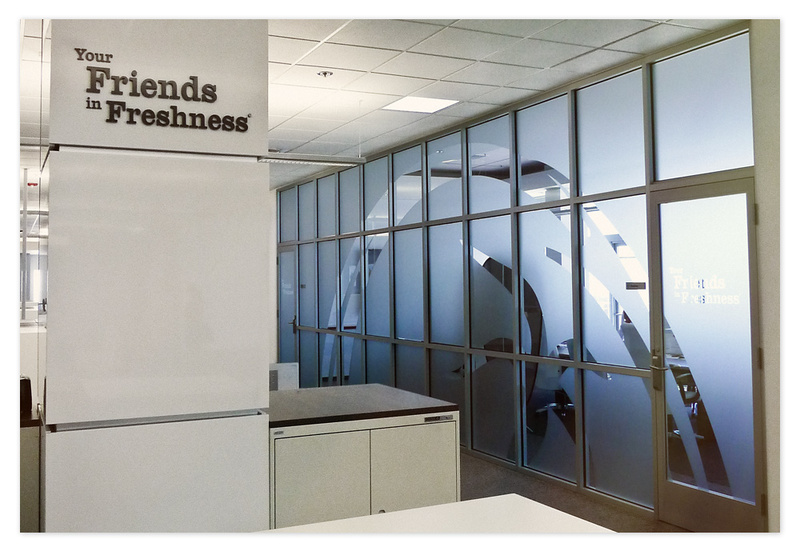 Understated graphics and a CNC extruded ‘freshness’ message adorns the wall, complete with a corner-mounted flatscreen playing a highlight reel of Windset media including chef guest spots on TV programs. The top photo is the final reception desk and panel wall just after installation of the LED panels, awaiting the graphics to be applied to the right. 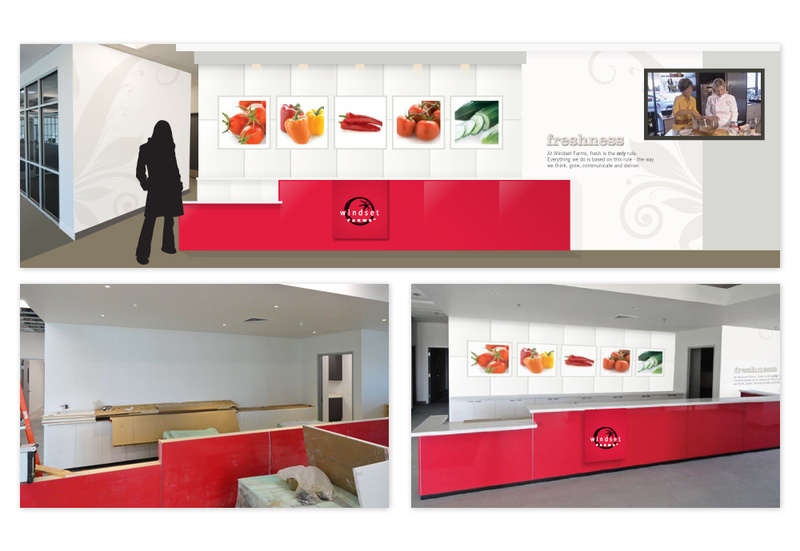 The three images just above show the reception desk area concept. I built the mock-up image on top of the construction photo shown on the bottom left. 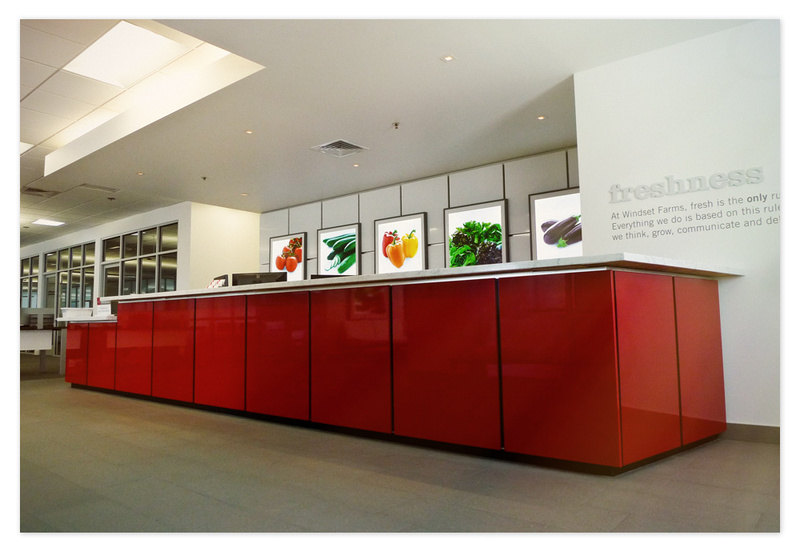 Reception area desk with the matching high gloss red and white panels, and 5 LED panels highlight Windset’s produce. 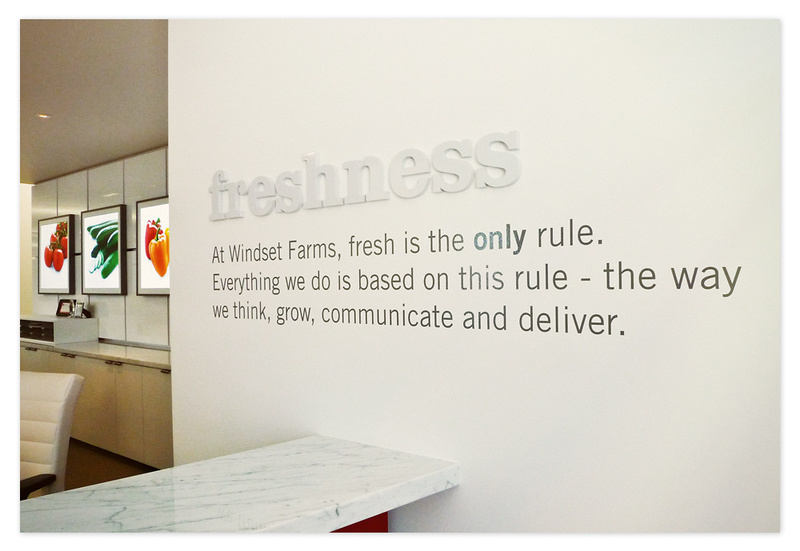 Windset’s freshness message is proudly displayed to the right of the reception desk. 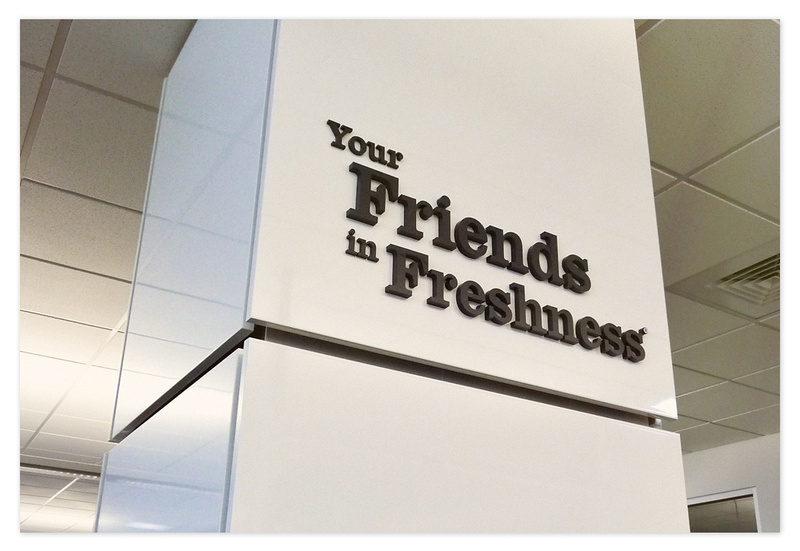 The word ‘freshness’ is extruded vinyl that pops off that wall giving more dimension. 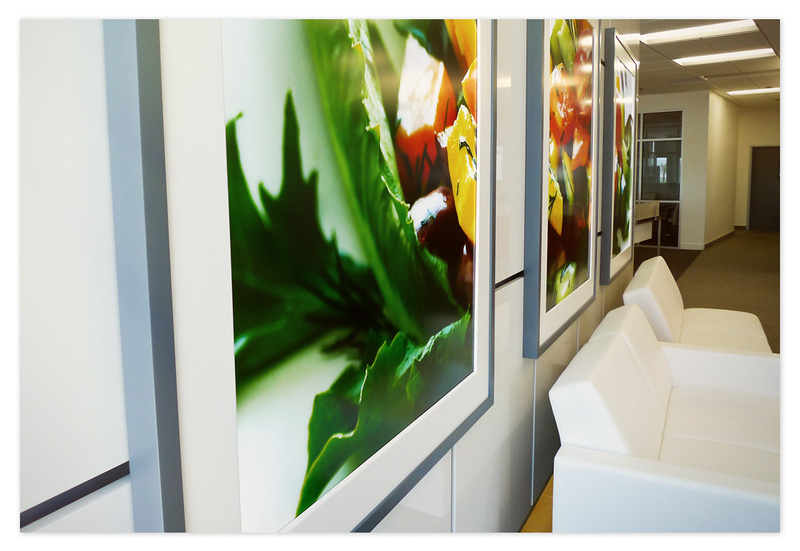 Close up photo of three of the five custom made 30″ LED panels that sit behind the reception desk area on the matching high-gloss white panel walls. 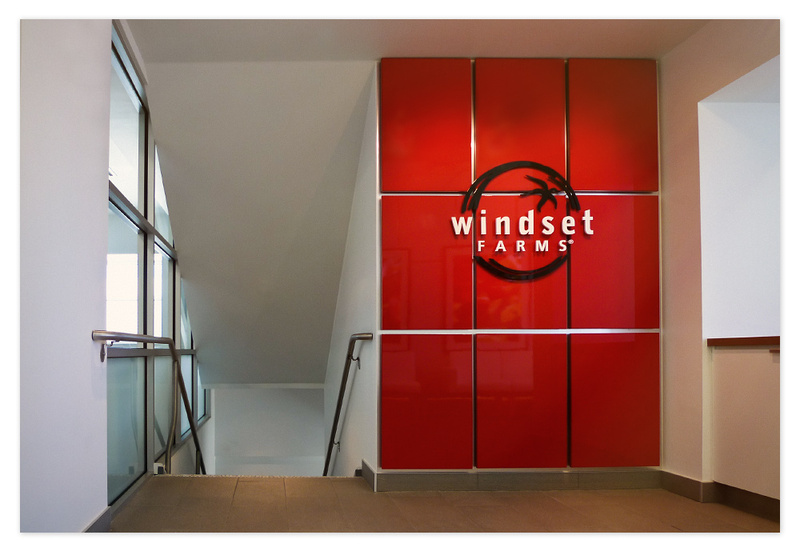 This extruded Windset Farms logo is the last thing visitors see as they leave the reception area. Mounted on high-gloss red panels that match the reception desk, it mirrors the panel look of the hero wall directly across from this. In addition to the environmental design components above, I also designed an extensive way-finding program throughout this large facility, both interior and exterior. This covered everything from the welcoming monument signs to how tractor-trailers navigate the 12-bay shipping area efficiently. 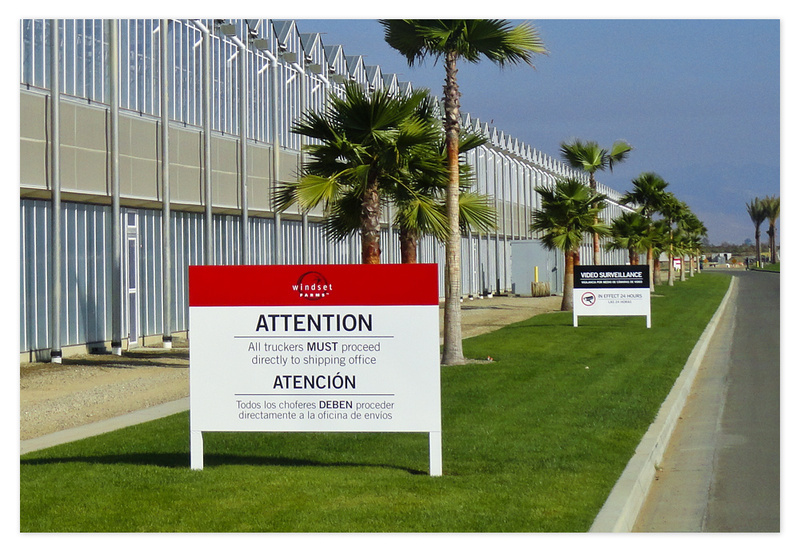 Above are a photo of the finished monument and wayfinding signage (in English and Spanish) to direct visitors and employees as they navigate the 64 acre facility. The top right photo is the first (of six) greenhouses to give you an idea of how large this facility will be when completed. From left: Monument sign welcomes visitors at the main gate; the greenhouse goes on as far as the eye can see; Visitors parking sign at the main office; as you leave, the welcome sign thanks you for visiting Windset Farms. Thermal formed monument signs sit at both entrances, lit up at night they’re quite dramatic. Large signage can’t be missed as visitors and truckers make their way around Windset’s expansive site. 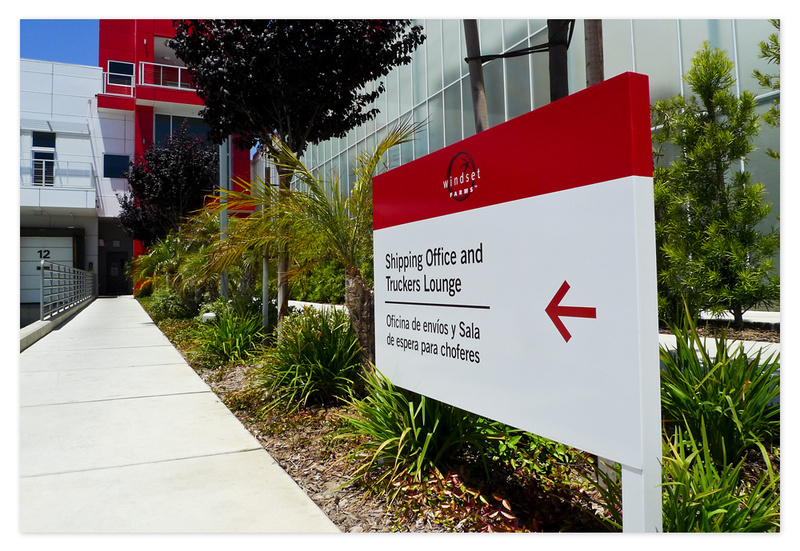 Wayfinding signage on the ground directs visitors and truckers throughout the entire site. 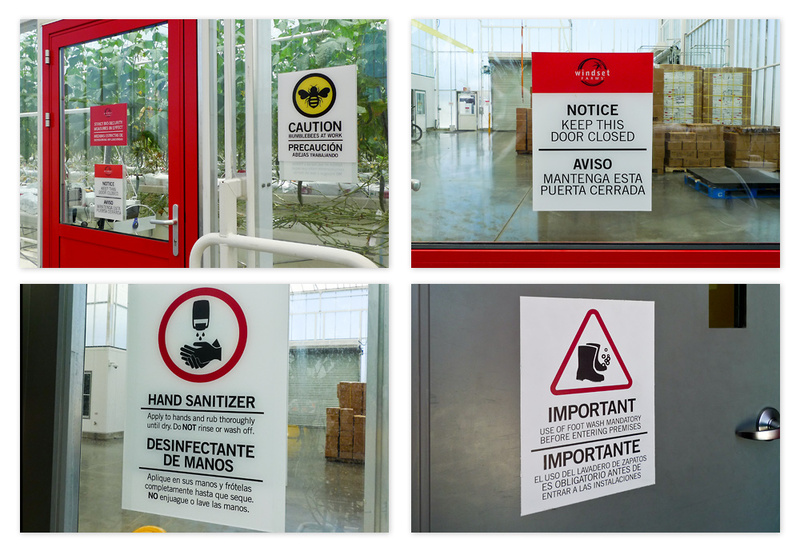 Interior signage is a large part of this job – hundreds of signs were created that help direct people around the building, and point out safety and contamination control best practices in and around the greenhouse. The state of California has the most rigid signage rules, and adheres to strict compliance with all ADA (Americans with Disabilities Act signage) which mandate inclusion for all peoples including the blind. This included creating secondary signs that include braille that cannot be mounted on the door). It was my job to ensure that all signs we created would pass the ADA compliance test. 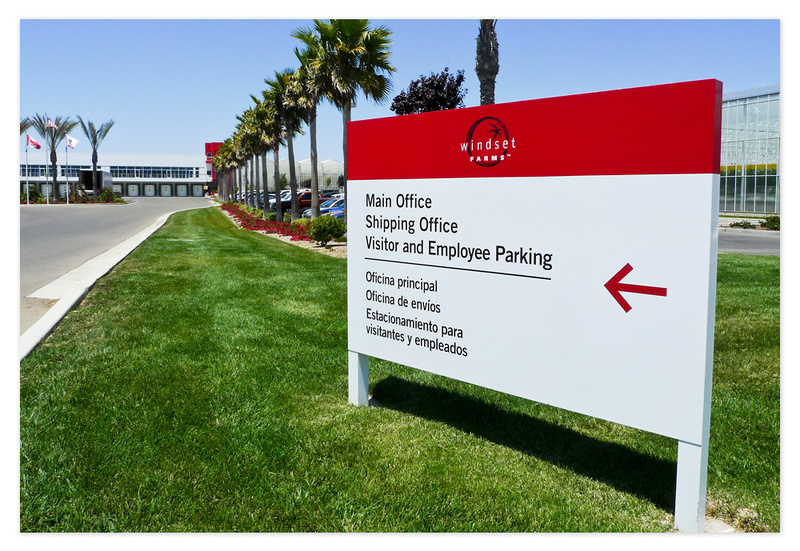 In addition to the hundreds of signs made, a complete signage overview master document was prepared for the client so that any other additional signage needed would complement the existing signage, and would also be California ADA compliant. 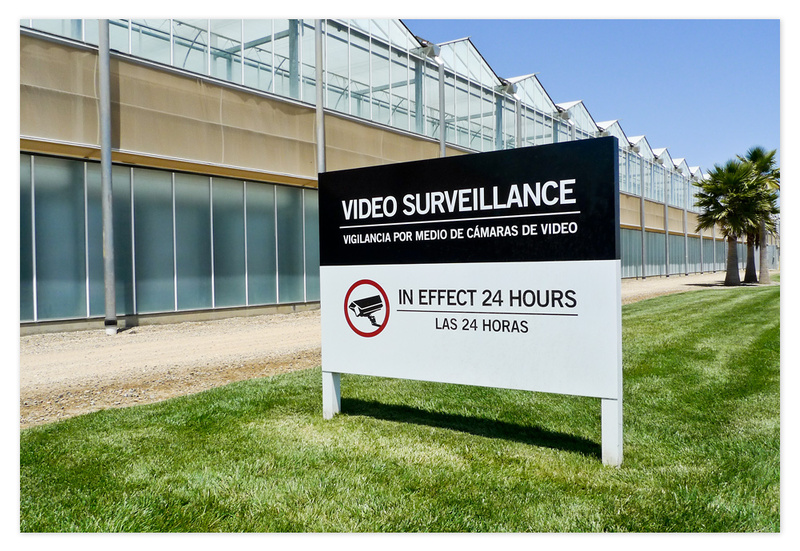 The interior signage covers all aspects of their operation, with the important safety and contamination control signs front and centre near the greenhouses. 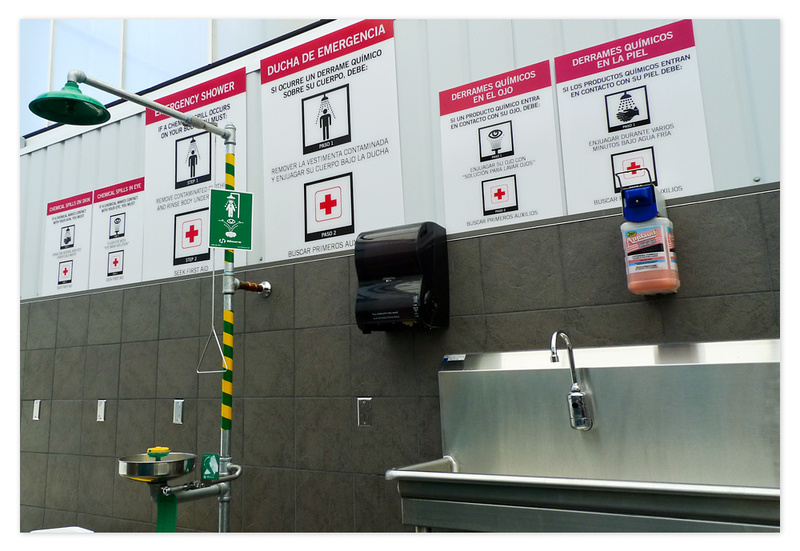 Washing station and emergency shower signage clearly lays out procedures in both English and Spanish. 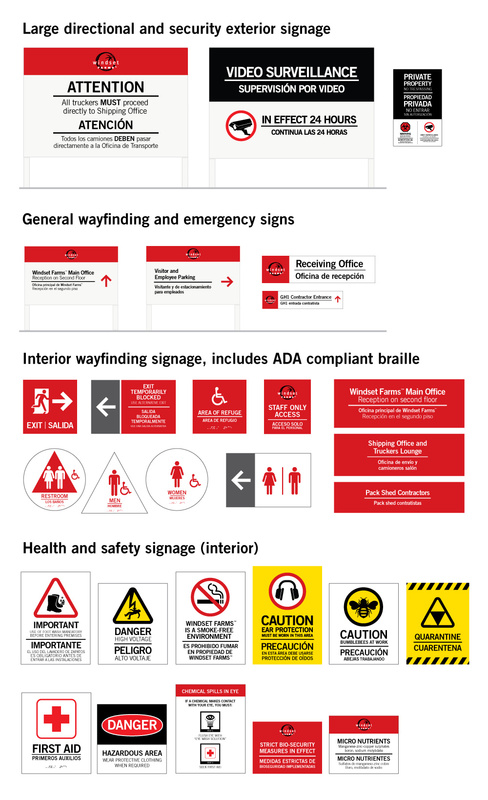 Overview of the different types of signage applied on site, ranging from large in-ground directional signage to the ADA compliant washroom signage. This has been one of my favourite recent projects, as it has allowed me to combine my interests in environmental and interior design with the graphic design I am better known for. I really enjoy, but rarely get to apply these other design facets in the studio setting. With creative direction from Tugboat, I conceptualized this project from the beginning through to coordinating with suppliers, contractors and the project coordinator overseeing this project in Santa Maria, California. This project was an interesting challenge because I was working with very little reference material. I also stood firm with my concept of simplicity and adhered to the less-is-more approach to design. It is a common tendency of graphic design studios to want to go heavy-handed on the ‘graphics’ in an environmental project, while the sensibilities of an interior designer will argue for ‘restraint’ in these regards. 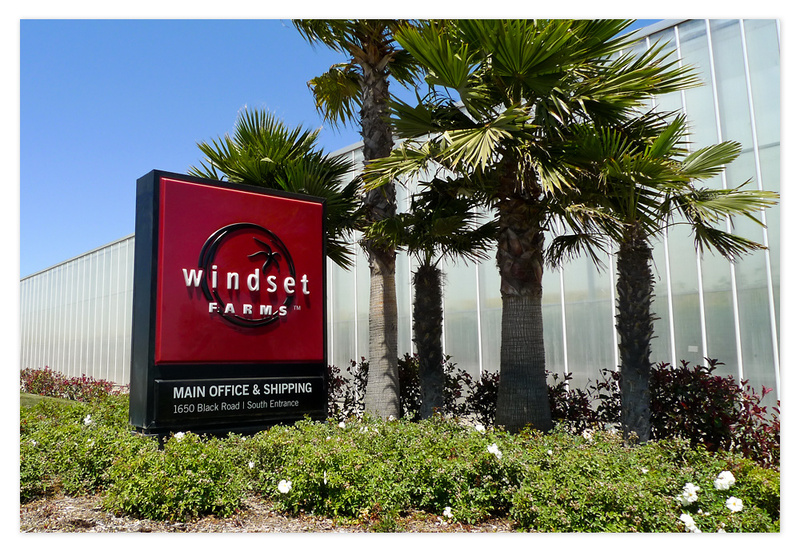 Windset Farms is one of North America’s premier greenhouse growers, based out of Delta, BC. They also have a new 3-million square foot greenhouse facility in Santa Maria, California. A gallery of final images that encompass the entire project including the interior design treatments, signage and wayfinding components. A small gallery of concept images that were presented to the client to move the project forward. 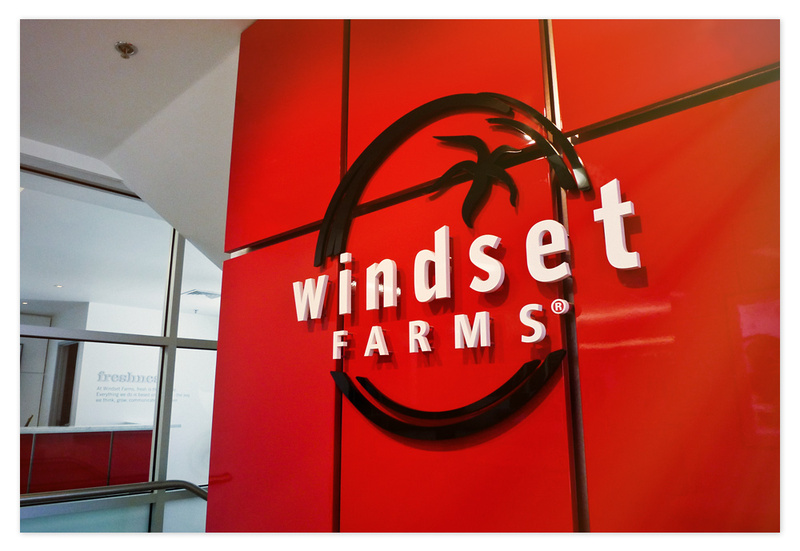 See also Windset Farms Packaging Design and updates to Windset’s website including the WindsetTV page.